Use as a part of combined therapy and prevention of acute and chronic localized degenerative-dystrophic diseases of locomotor apparatus such as: osteoarthrosis, osteochondrosis, spondylarthrosis, arthritis, joint dysplasia, synovitis, bursitis. It contains glycosamine hydrochloride as an active ingredient, as well as excipients (including extracts of sweet devil’s-claws, pine buds, artemisia herb, fennel fruits, licorice root, mint leaves, thyme herb, calendula flowers, milfoil herb, tutsan herb, camomile flowers, caraway fruits, rosehip fruits, celandine herb and moomiyo). Use as a part of combined therapy and prevention of acute and chronic localized degenerative-dystrophic diseases of locomotor apparatus such as: osteoarthrosis, osteochondrosis, spondylarthrosis, arthritis, joint dysplasia, synovitis, bursitis; to prevent flares of chronic diseases of joints and tendons; to remove inflammatory process associated with significant loadings, injuries, hematomas, tensions and tears of ligaments in horses and dogs. The drug is intended for external use. Apply stripe of the cream in a thin layer on dry intact affected skin area previously cleaned from dirt. Rub and gently massage until total absorption occurs. Repeat this procedure once or twice a day. Long-haired dogs: previously cut out an application site. Repeat this procedure till recovery. In order to achieve franker and longer effect, you may use air-proof bandage after the drug rubbing. It is recommended to afford rest to an animal (20-30 minutes) after the drug administration. Increased individual sensitivity to the drug components. Do not apply on damaged skin and mucosae. Do not allow drug licking before complete drying. Animal-based products can be used without restriction during and after the drug administration. Adverse events and complications generally are not observed in case of administration as per package insert. Cream components may cause idiosyncrasy. In case of allergic reactions, stop administration. 100 ml polymeric tube in carton, 250 ml polymeric tube, 500 ml polymeric bottle. Store in original package. Protect from light and moisture. Keep out of the reach of children and animals. 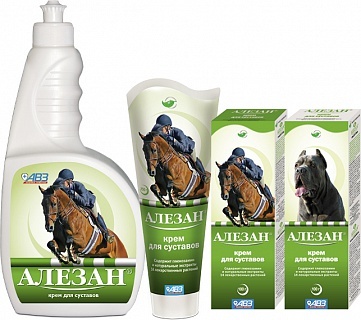 Store separately from food and animal feeding at 5-25°С. 18 months from the date of production.